The rebuild project will be complete by mid-2018, according to Long Beach city staff. LONG BEACH ― The rebuild project for Long Beach’s Alamitos Bay Marina is expected to be completed by summer 2018, according to city staff. Bellingham Marine, the company contracted to redesign the marina, lists this fall as the completion date, interestingly enough. The marina has 353 slips offline and 42 vacancies, mostly in the 35-foot to 40-foot range, as of the end of June, according to Elvira Hallinan, marine bureau manager for the Department of Parks, Recreation and Marine. Alamitos Bay Marina will have 1,655 slips for vessels between 15 and 115 feet in length when completed, as The Log previously reported. Bellingham Marine initially projected the undertaking to take four to five years. The project began in fall 2011 with the rebuild having gone through six phases and is currently in its final phase, according to the Bellingham Marine website. “The entire project is expected to be complete by fall 2017,” the Bellingham Marine website stated. However completion of the rebuild, according to city staff, is and has been projected for 2018. “The completion date has always been early summer 2018 for in-water reconstruction; Basin 6 reconstruction is scheduled for fall 2017,” Hallinan clarified. The six initial phases included reconstruction or replacement of various basins, paving the parking lots, utility work and restroom construction. “The last phase, phase seven is currently underway and includes the reconstruction of the balance of the docks in basin 3, basin 7 and basin 6,” stated the Bellingham Marine website. Multiple attempts have been made to contact Bellingham Marine’s General Manager for the Southwest Division Jim Puder by The Log to clarify the project parameters with no success. Members of the Long Beach Marina Boat Owners Association (BOA) appear to be satisfied with changes being made at the marina. “The BOA members I have talked to are very happy with the quality of the new concrete docks and amenities, such as the dockside pump out stations,” Dr. Tom Mayes, Long Beach Marina BOA president, shared with The Log. Wooden docks have been replaced with concrete ones as part of the Alamitos Bay Marina Rebuild project. The city has received millions of dollars in bonds to finance each phase of the project. The amount of money spent so far on this rebuild amounts to $94,375,315, Hallinan revealed when asked. The BOA’s “understanding is that the project is on time and within budget estimates,” Mayes stated. Various news outlets reported the entire cost of the rebuild project was estimated to be between $96 million and $98 million. The marina rebuild project encompasses “new gangways, docks, piles, seawall repair, dredging, in-slip pump outs, utility upgrades where needed to accommodate new slip mix as well as new utilities at all docks,” Hallinan said. 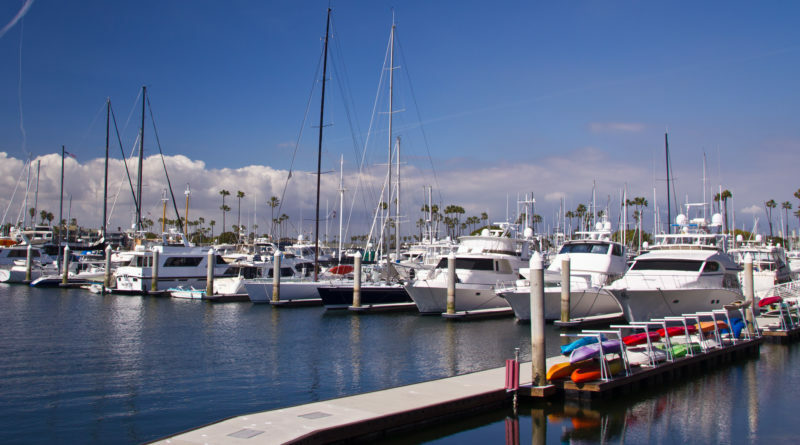 Long Beach’s marinas, which encompass Alamitos Bay as well as Rainbow Harbor and Shoreline, are the largest single-property managed marinas on the West Coast.